It’s the good news that the Alabama nation has been waiting to hear for months. The heralded freshman Dee Hart, who electrified the field scoring a TD, went down in the off-season with a serious knee surgery. 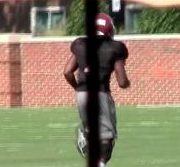 This summer, Hart tore his anterior cruciate ligament while participating a 7-on-7 passing drill with Alabama teammates. Coach Saban initially speculated that Hart may not be able to run until October and could possibly see practice time by end of regular season close to the bowl season. Now with new video showing Dee Hart jogging, it looks like the young phenom running back is on the fasttrack to recovery. In the video, you can see him with a brace on jogging. Whether the coaching staff pulls the trigger to play him late in the season is way too far out to predict, but it certainly is a welcome sign to see him recovering. Dee Hart was already pushing for a solid 3rd string position with the running backs, so he is very talented. Hopefully he can get well and be part of the team soon without any issues from the knee. Whether Saban will play him part of a season remains to be seen, but if he seen Hart was 100% and there was a chance to win the national title using Hart in the rotation.